Every year at Christmas or birthday time I get told that I am “so difficult to buy for” so this month I’ve put together a list a five gadgets that would certainly put a smile on my face. I’ve not purchased any of these gadgets and this is not an in depth review. It’s simply a light-hearted look at some interesting “toys” to open and play with. Apple stole the march on this range of tech with its gorgeous iPad but it had a number of shortcomings – the biggest being the price. The basic 16GB model cost £429 which some considered rather high given you could get two netbooks for the same outlay. This is where Android has stepped in to plug the gap. A whole range of Android based devices have come flooding onto the market and the Elonex eTouch is priced at the entry level. It won’t have the slick feel of the iPad but at this price you will get access to the Android Market place which boasts over 70,000 apps of which 57% are free compared with Apples 27%. It only has 2GB of storage but does offer a MicroSD slot making it easy to boost storage space, something the iPad has missing. Like the iPad, this is a great media consumption device that will connect to your wireless broadband allowing you to browse the internet with ease. The 7″ version of eTouch only has version 1.6 of the Google Android Mobile OS but the 10″ has version 2.1. 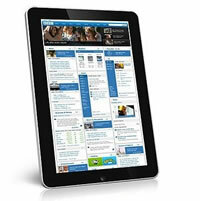 The main advantage to 2.1 is the addition of multi-touch and better web browsing with support for HTML5. Both 7″ eTouch and 10″ eTouch are on sale at Toys’R’us but if you search the web you may find if cheaper. Most women would roll their eyes if their man came home with one of these (well I know one would at least) but how impressed would your friends be? This is a complete mans toy but I suspect when us men are out of the room there’ll be plenty of ladies dancing round the room like Hermione Granger. First seen on the BBC’s Dragon’s Den, this wand-style button-less universal remote control can learn and store up to 13 different codes so you can use it to control several different devices at once. The wand also ‘talks’ back to you to let you know what mode it’s in using a series of pulses that you will be able to feel as you hold it. BBC one…just swish and flick. 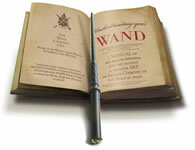 The Magic Wand Remote Control is available from Paramount Zone. This may seem an odd entry but this is a great device to get the whole family into Geocaching (pronounced geo-cashing). What is geocaching? Gocaching is a high-tech treasure hunting game played throughout the world by people equipped with GPS devices. The basic idea is to locate hidden containers, called geocaches, outdoors. It is a fantastic way to integrate execise with technology. Geocaches are listed on many websites, the most prominent being www.geocaching.com. You can even set up your own Geocache for others to find. There are also smartphone apps available for the iPhone and google Andriod but this device is rugged and designed for outdoor use; and the potential for being dropped! The cheapest place I found the Garmin eTrex H was at Ebuyer. This really is the toy for the “Man and Boy” (or girl) but I doubt the child will be allowed anywhere near this when Dad gets building. This small Robot Arm comes in the form of a kit and can then be connected to your PC running Windows XP of above. Once connected, you can use the mouse or keyboard to control the Arm or program a sequence of actions and then save them out. It can lift a maximum of 100g and the arm can move through 270 degrees. The children will be fascinated to see how the computer is used to control mechanical devices and it creates a fun and exciting way of learning and experimenting with the computer. 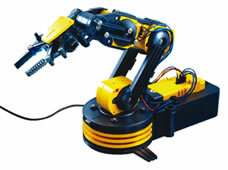 The Maplin Robotic Arm Kit is unsurprisingly available at Maplin. I don’t need one of these because I never lose my keys…ouch, “what was that for?” he says turning to his wife. 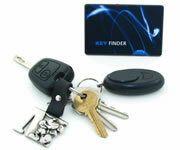 This gadget comes in two parts, a small fob for the keying and a credit card sized transmitter to store in a safe place, like a purse of wallet. Operation is effortless; simply press the button on the transmitter and a signal is sent to the fob. If the key fob is in range ot emits a loud beep together with a flashing light. The device has a 40 metre (120 foot) range so you can locate keys wherever your child hid them. Yes…I do know a 2 year old that played this game with their mother.